To send a submission, you need to be an AIS member and have an AIS account. If you are not an AIS member, please click here to register for an AIS membership and to receive your AIS account information. Log in to the site with your AIS username and password. Look for the log-in box on the right side of the site. 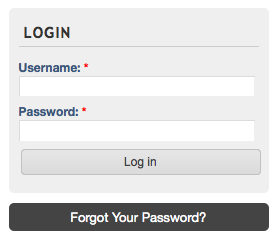 If you have forgotten your password, please try resetting it by clicking on the 'Forgot your password' link. If you have any trouble resetting your password, please email admin at iranianstudies dot com and we will reset it manually. Once logged in, you should see the following link where the log-in form used to be, simply click on it to go to the submission form (you will only see this link if you are logged in). You will see paper/panel submission. If you click on panel, the forms for the panelists will appear. Be sure to scroll down. The Panel Chair is responsible for completing the submission. Fill out the submission form. You can indicate whether you are submitting a Paper or a Panel proposal. You are done! You can always check the status of your submission by logging into the site and clicking on "My Papers" on the side-menu. One submission is allowed per member. Indicate whether you are submitting a Paper or Panel proposal on the submission form. You are also required to pre-register for the conference. To pre-register, please click here. The Program chair will announce the results of the adjudication by June/July 2011. The deadline for cancellation of attendance on the program for the purpose of registration refunds will be Feb. 1 2012 (membership dues are not refundable). All cancellation requests (please include the last four digits of your credit card, Date of Payment, Invoice # and Transaction ID) should be addressed to director at iranian-studies dot com and NOT to the conference Program Chair or the Conference Chair.